Mr. Dean: Don't you like children? Conflicts of many kinds are present in Michael Powell and Emeric Pressburger's Black Narcissus, set against the beauty and danger of the Himalayas. These include the shock of Anglo-Catholic nuns set in the midst of the mountains among natives who speak no English, the struggle between flesh and the spirit, between medicine and superstition, between vows and longing for a different life, and between the monied classes and the impoverished. Image Transfer Review: This motion picture features one fabulously gorgeous image after another, and Criterion's restoration does Cardiff's photography quite proud. Colors are eyepopping, blacks are rich and the painting of light and shadow is truly extraordinary throughout. There is excellent detail to be seen in the closeups, particularly of Sister Ruth as she descends into madness. There is an occasional slight jitter from side to side, seen in the opening credits, some closeups of Sister Clodagh and the last shot of the palace as it disappears into the mist. This is really the only drawback to an extraordinarily beautiful transfer. Audio Transfer Review: As is too often true with British films of fifty years ago and more, there is a fair amount of noise and hiss to be heard on the audio track. The music tends to sound tinny and lacking in depth. These are, however, clearly problems with the source material rather than the audio transfer. Thus the grade is not as low as it might be otherwise. The sound is the original mono. Extras Review: Criterion gives us a splendid special edition of this film, the highlight of which is the 1988 commentary recorded by director Michael Powell in tandem with Martin Scorsese. The commentary is screen-specific. Powell gives a few behind-the-scenes stories, but the content mostly is confined to pointing out notable shots and performances. This isn't the most enlightening commentary, but it's certainly interesting to hear Powell talk. Scorsese is less useful, often indicating shots which he claims inspired sequences in his own films. However, he is certainly enthusiastic. Much more interesting is a new documentary on the cinematography of the film, Painting with Light. This 27-minute film includes interviews with the Oscar®-winning cinematographer, Jack Cardiff, and discussions of the technical aspects of three-strip Technicolor and the problems involved in getting the proper look for the film. This is certainly a welcome addition considering how very important the visuals are in this picture. The heavily speckled and damaged clips from the film included here make it clear how much restoration work has been done, for which we should all be appreciative. Rounding out the package is a lengthy theatrical trailer in decent condition, but nowhere near as pristine as the main feature. A splendid visual experience and a moving portrayal of human emotion and clash of cultures, given a terrific presentation by Criterion. 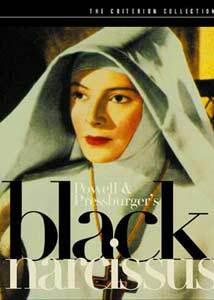 One of the most gorgeous films I've ever seen, Black Narcissus is very highly recommended.